The world of coaching is constantly changing and growing. Although there is still some confusion out there about what coaching is really all about, it is becoming better known and accepted as a process that can be of real help to people. Meaningful, tangible results are being generated every day around the world as individuals search for ways to improve how they work, manage, lead, support others, and just plain live. As an executive and leadership coach I am careful to avoid personal, relationship issues. However, life happens and what is happening in a person’s personal life affects what is happening in their work. So although I am definitely not a life coach, personal development will involve personal relationships. I am also not a career coach: I have neither the training nor the assessments that career coaching often requires, but again, life happens! Career situations change and if I am coaching a client who happens to be experiencing a career change, we work through it. Working with a client necessitates the building of a relationship of trust that allows for vulnerability on the part of the client. This is a huge responsibility and requires a commitment and confidentiality on the coach’s side. This is where professionalism comes into play, and the need for coaches to have the proper training and certification. A trained, professional coach has demonstrated that they have the competencies for the role and understanding of the ethics and responsibility of the practice. It is too easy for some people to hang up a shingle and call themselves a “coach” just because someone told then they were a good listener, or they like to “help people”. A certified, professional coach has demonstrated to a professional body that they are capable and qualified to use the coach designation. The largest international coaching body is the International Coach Federation (ICF), which has over 30,000 members in over 140 countries. ICF also accredits schools that teach and train coaching so that graduates receive certifications in line with coaching core competencies. 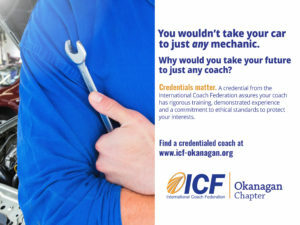 Certified coaches credentialed by ICF undergo a rigorous process of initial vetting and training and are required to maintain their certifications through continuous learning. ICF also maintains a database of credentialed coaches. You can search the database to find a coach that will meet your specific needs. As a rule it is always a good idea to check out two or three different coaches to find the one that is the best fit for you. Most coaches will also offer a free initial “discovery” session so that you can experience how they coach. Finally, ICF takes its ethics standards very seriously and provides a process to handle issues relating to unethical practice. So, just like you wouldn’t want to take your vehicle to someone who isn’t a trained auto mechanic, why would you want to be coached by someone who isn’t qualified?